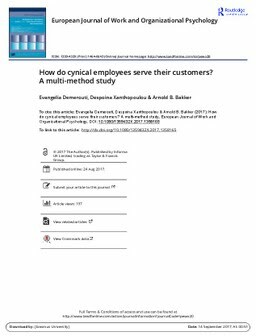 In this multi-method study, we investigate how social job demands (i.e., social interruptions) and resources (i.e., colleague support) in the service context influence employee (negative) (re)actions to customers through cynicism towards the job. In addition, we investigate why customers are less satisfied with the provided service when employees endorse a cynical attitude. To test the hypothesized process, we used observer ratings of the employee–customer interactions regarding the number of interruptions and employee negative (re)actions during service encounters, employee self-reports of overall colleague support and daily cynicism, and customer-ratings of service quality. Participants were 48 service employees and 141 customers. Results of multi-level structural equation modelling analyses showed that whereas the number of observed social interruptions during service encounters related positively to cynicism, social support related negatively. Cynical employees exhibited more negative (re)actions towards their customers (e.g., expressed tension, were unfriendly). Consequently, the more negative (re)actions employees showed towards their customers, the less satisfied customers were with the service quality. The study contributes to the literature by explaining what makes service employees cynical about their work, and why cynical employees provide low-quality services.